BEIJING. It didn’t take long for Las Vegas matchmaker Sean Gibbons to book IBF superflyweight champion Jerwin Ancajas’ third title defense against Jamie Conlan in Belfast, Northern Ireland, on Nov. 18. Doing things efficiently in a snap is something Gibbons is known for in boxing circles and he takes special care of his glowing reputation as an action man. Gibbons, 50, has been involved in boxing since 1985 and relocated from Oklahoma to Las Vegas in 1997 to stay close to where the heart of the sport beats. He used to work for Bob Arum at Top Rank then went on his own as an independent matchmaker. Today, Gibbons arranges fights all over the world in behalf of promoters who trust in his ability to get the job done. 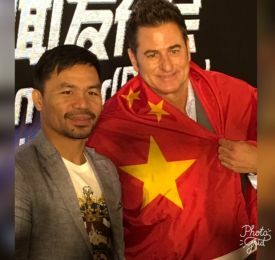 Last Friday, Gibbons was in this Chinese capital to witness the bouts that he assembled for Sen. Manny Pacquiao, Dancing Sports and the Professional Boxing Commission of China. Gibbons called Ancajas “the future of Philippine boxing.” What opened Gibbons’ eyes to Ancajas’ brilliance was his win over Puerto Rico’s McJoe Arroyo to capture the IBF crown last year. “Jerwin’s victory over McJoe was impressive,” he said. “McJoe was then considered one of the world’s top five fighters, pound for pound and Jerwin won decisively. Jerwin’s composure sets him apart from others. He can punch, he can box and he’s hard to hit. He’s smart, he’s fast, he’s fearless and he’s strong.” Arroyo was floored once in the eighth round and lost by a unanimous decision. Last July, Gibbons took Ancajas to Brisbane to face Japan’s Teiru Kinoshita in the Pacquiao-Jeff Horn undercard and once again, the Filipino delivered. Kinoshita was stopped in the seventh round. Gibbons will now bring Ancajas to Belfast for a huge test against the unbeaten Conlan. Gibbons is a fixture in nearly every big boxing promotion anywhere in the world and a visible figure at each event because he’s in and out of the ring, taking photos with his cellphone, standing beside the ring announcer before and after a fight and making sure things are in order in the opposite corners. As a matchmaker, he’s involved in virtually every aspect of a fight, except wearing the gloves himself. It’s been his life and passion for over 30 years with Filipinos among his favorite business associates. To arrange fights for Filipinos, Gibbons has worked with Pacquiao, Arum, Michael Koncz, Joe Ramos, Sammy Gello-ani and Sampson Lewkowicz. He also deals with Floyd Mayweather, Jr., Oscar de la Hoya and the other big names of professional boxing. In 2012, Gibbons suffered a broken rib as he was assaulted by irate fans in the wake of Casimero’s win by technical knockout over Luis Lazarte in Argentina. Gibbons worked Casimero’s corner in the bout. The experience was charged as a hazard in Gibbons’ trade and it’s one of the things he’s learned to endure in carving his niche as a major player in the fight game.